Squash is a surreal poem inspired by Helen’s mother, Ruth Hajnoczky, who, standing over a pot of cooking squash, proclaimed that “squash doesn’t keep forever!” in a wise and knowing tone that made the proclamation sounds like a well-known idiom. 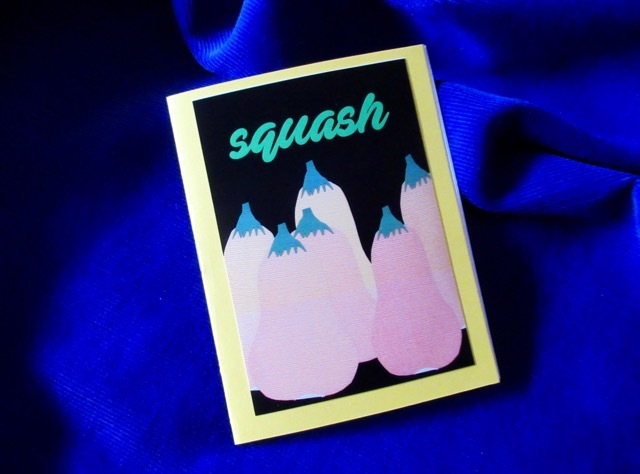 Squash mashes the word “squash” up with idioms, blending them into a hilarious and satisfying poem about, well, squash. This chapbook was originally created for Calgary Canzine 2018. Helen Hajnoczky’s first published poem, Squash originally appeared in issue 41 of filling Station magazine in 2007. Copies are available on their own, or as part of the Canzine ?! Press Pack.